Tuberous sclerosis complex (TSC) is an autosomal-dominant disease characterized by the presence of hamartomatous lesions in various organs. TSC occurs in 1 in 6,000 to 1 in 10,000 live births and the prevalence is approximately 1 in 20,000. The condition is due to the mutation of the TSC1 or TSC2 gene: most of the patients (80%–90%) carry TSC2 mutation, whereas the remaining ones carry TSC1 mutation. TSC, typically, shows a triad of clinical features (Vogt’s triad) composed of epilepsy, mental retardation, and adenoma sebaceum (facial angiofibroma), although the full triad is seen only in 40% patients. TSC may show different degrees of severity with a wide range of clinical manifestations, depending on the organ systems involved and the age of the patient. Classically, diagnosis is based on the clinical and neuroimaging findings. Diagnostic criteria for TSC were revised during the second International Tuberous Sclerosis Complex Consensus Conference in 2012 [Figure 1]., The major clinical manifestations of TSC result from hamartomatous lesions, especially of the skin, brain, heart, and kidneys. In particular, the most frequently occurring intracranial lesions in TSC include cortical and subcortical tubers, subependymal nodules (SENs), subependymal giant cell astrocytomas (SEGAs), and white matter abnormalities., Additional rare intracranial findings of TSC include dysgenesis of the corpus callosum, mild dilatation of lateral ventricles, cerebral aneurysm, infarction, cerebellar atrophy, chordoma, neurofibromatosis, arachnoid cyst, microcephaly, macroencephaly, and Chiari malformation More Details. We described our experience regarding an 8-year-old girl affected by TSC with a rare association of Chiari malformation type I (CMI). An 8-year-old girl was admitted during the night in our emergency department for an acute episode of seizures characterized by upper limbs’ tremor, trunk rigidity, chewing motions, and eye deviations. At the time of admission, the patient’s blood pressure was 110/70mm Hg, heart rate was 95 beats/min, respiratory rate was 18 /min, SpO2 was 99%, and body temperature was 36.2°C. Her electrocardiography showed sinus rhythm, a normal QT interval, and nonspecific ST-T wave changes. 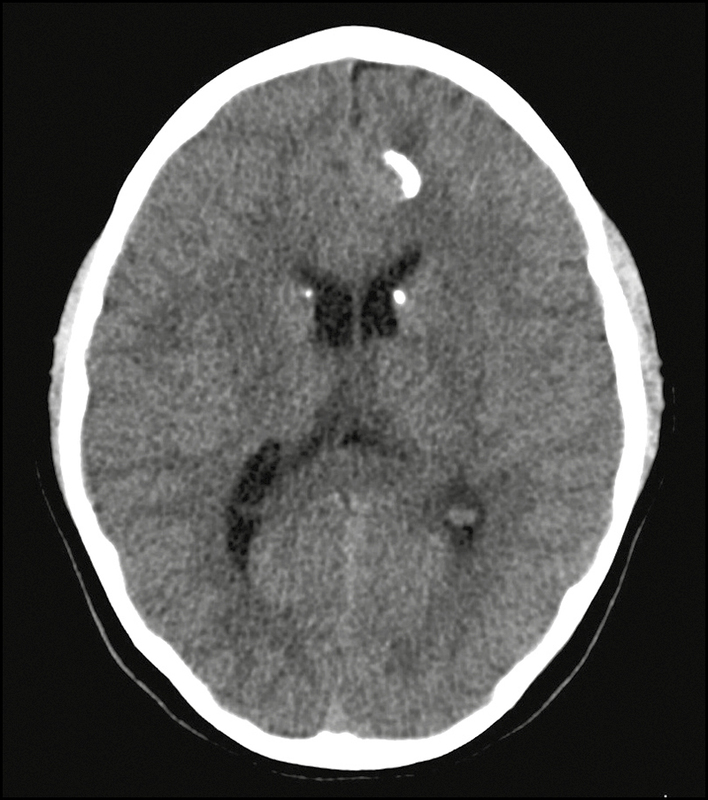 She was further evaluated with a brain computed-tomography (CT) scan that revealed left frontal calcified nodules and calcified periventricular SENs [Figure 2]. The high clinical suspicion of TSC was confirmed by brain magnetic resonance imaging (MRI) that was performed without gadolinium administration by express will of the patient’s parents. 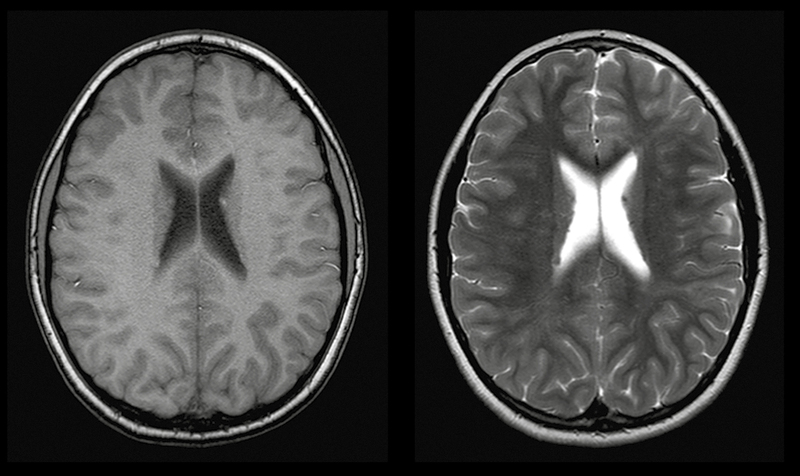 MRI of the brain revealed the presence of various cortical and subcortical nodules that appeared isointense with respect to cortical and slightly hypointense with respect to the white matter on T1-weighted imaging (T1WI) sequences and high signal both in T2-weighted imaging (T2WI) sequences and in fluid-attenuated inversion recovery (FLAIR) sequences [Figure 3]. Also, we observed calcified periventricular SENs that appear hyperintense on T1WI sequences and hypointense on T2WI sequences [Figure 4]. Moreover, MRI of the brain revealed a downward displacement of the cerebellar tonsils through the foramen magnum (CMI) of 7mm and an associated hydrosyringomyelic cavity in the cervical spine area [Figure 5]. Electroencephalogram revealed the presence of left frontal sharp waves. 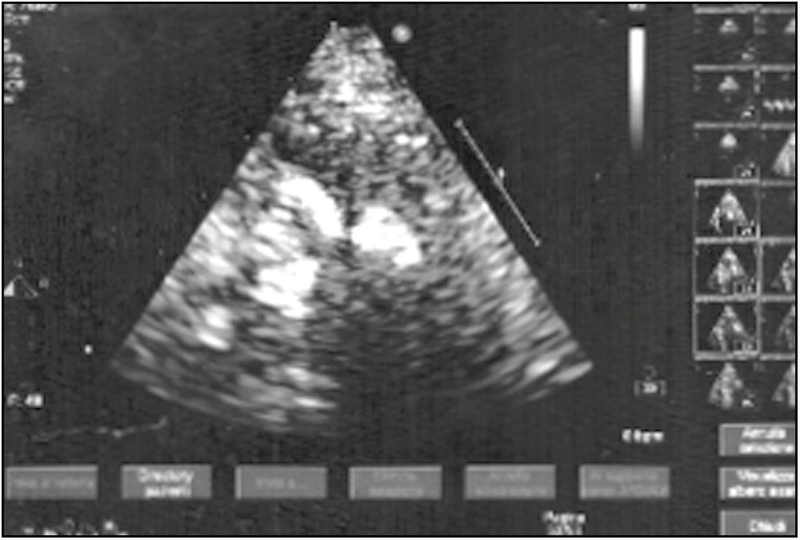 Echocardiography showed three well-circumscribed homogenous hyperechoic masses that involved left ventricle apex [Figure 6]. No abnormalities were found on ultrasound evaluation of the abdomen. The patient had no dermatologic involvement, eye injuries, and other cardiothoracic manifestations. Mental level and school performance of the patient were normal. TSC is a greatly variable neurocutaneous disorder that can affect virtually any organ in the body and is highly variable in clinical presentation and findings. Analyzing the current diagnostic criteria for TSC, it is seen the presence of two imaging findings allows a conclusive diagnosis of TSC even in the absence of other typical signs and symptoms, such as in our case., Central nervous system (CNS) lesions are the primary cause of morbidity and mortality in TSC and the associated neurologic symptoms involve seizures, autism, developmental disorder, mental retardation, and learning and behavioral problems., Four common brain lesions are cortical tubers, white matter abnormalities, SENs, and SEGAs. In our case, we made a conclusive diagnosis of TSC by demonstrating the presence of two major neuroimaging diagnostic criteria such as cortical dysplasias (cortical tubers and white matter radial migration lines [RMLs]) and SENs. In particular, cortical tubers are usually composed of a proliferation of glial cells, are variable in size, and can be multiple in the same patient. They appear hypodense on CT evaluation, show contrast enhancement in approximately 3–4% of cases and can be calcified in as many as 50% of patients, such as in our case. Also, on MRI evaluation, they usually showed low signal on T1WI sequences and high signal on T2WI and FLAIR sequences. In our case, tubers showed low signal with respect to the white matter on T1WI sequences and high signal on T2WI and FLAIR sequences. Instead, white matter RMLs can be found extending from the ependymal ventricular surface toward the cortex. These lesions, which are derived from reduced myelin or increased gliotic reaction, generally do not show contrast enhancement and are seen as high-intensity areas on T2WI and FLAIR sequences and low-intensity areas on T1WI,, as can be observed in our images [Figure 3]. SENs are small protrusions into the cerebrospinal fluid cavity, often with associated calcifications. CT scan evaluation typically showed multiple calcified lesions along the lateral ventricles bilaterally, whereas in MRI, they appear hyperintense on T1WI and iso- to hyperintense on T2WI. SENs and cortical tubers, if calcified, may appear hypointense in gradient T2* sequences. Furthermore, SENs can exhibit contrast enhancement, but it is not certainly an indication that a SEN is going to grow or that surgery is necessary. In our patient, SENs appeared as various calcified periventricular lesions on CT images, hyperintense on T1WI, and hypointense on T2WI. SEGAs are characterized by proliferative astrocytes and giant cells, and it is widely accepted that they typically arise from SENs, especially near the foramen of Monroe., Compared to the SENs, SEGAs, generally, show more contrast enhancement. Although SEGAs are benign and generally slow-growing, they can cause serious neurologic involvement including obstructive hydrocephalus. We also showed three well-circumscribed homogenous hyperechoic masses that involved left ventricle apex on echocardiography. These findings were suggestive of cardiac rhabdomyomas that are benign striated muscle tumor and are one of the common manifestations of TSC. These lesions can compromise ventricular function and on occasion, can interfere with valve function, or result in outflow obstruction. Definitely, we demonstrated the presence of three major diagnostic criteria for TSC: cortical dysplasias, SENs, and cardiac rhabdomyomas. We did not find dermatologic features, eye injuries, abdominal manifestations, and other cardiothoracic lesions, but we revealed the presence of CMI, a rare CNS association with TSC. Specifically, CMI is defined by the caudal dislocation of the cerebellum with the herniation of tonsils above 5mm, below the foramen magnum in MRI evaluation, in addition to the tonsil stretch in the shape of a pin. It can cause several clinical conditions because of direct compression of the neural tissue at the craniovertebral junction or cerebrospinal fluid disturbances, and are usually complicated by syringomyelia., In this case, we revealed the presence of a 7-mm CMI with an associated hydrosyringomyelic cavity between the third and the seventh cervical vertebrae. Despite this, the patient had no symptoms related to these last two associated conditions, although they may clinically manifest itself at any moment causing a general worsening of her prognosis. TSC is an unusual multiorgan disorder that can clinically manifest itself in different ways. The association between TSC and CMI is rare,, and not many studies are reported in the literature. Neuroimaging plays a crucial role in the correct and conclusive diagnosis of TSC as well as for other rare simultaneous CNS abnormalities allowing an accurate management of the patient. Hu S, Hu DY, Zhu WZ, Wang L, Wang Z. Tuberous sclerosis complex: Imaging characteristics in 11 cases and review of the literature. J Huazhong Univ Sci Technolog Med Sci 2016;13:601-6. Krishnan A, Kaza RK, Vummidi DR. Cross-sectional imaging review of tuberous sclerosis. Radiol Clin North Am 2016;13:423-40. DiMario FJ Jr. Brain abnormalities in tuberous sclerosis complex. J Child Neurol 2004;13:650-7. Umeoka S, Koyama T, Miki Y, Akai M, Tsutsui K, Togashi K. Pictorial review of tuberous sclerosis in various organs. Radiographics 2008;13:e32. Yates JR, Maclean C, Higgins JN, Humphrey A, le Maréchal K, Clifford M, et al. The Tuberous Sclerosis 2000 Study: Presentation, initial assessments and implications for diagnosis and management. Arch Dis Child 2011;13:1020-5. Northrup H, Krueger DA; International Tuberous Sclerosis Complex Consensus Group. 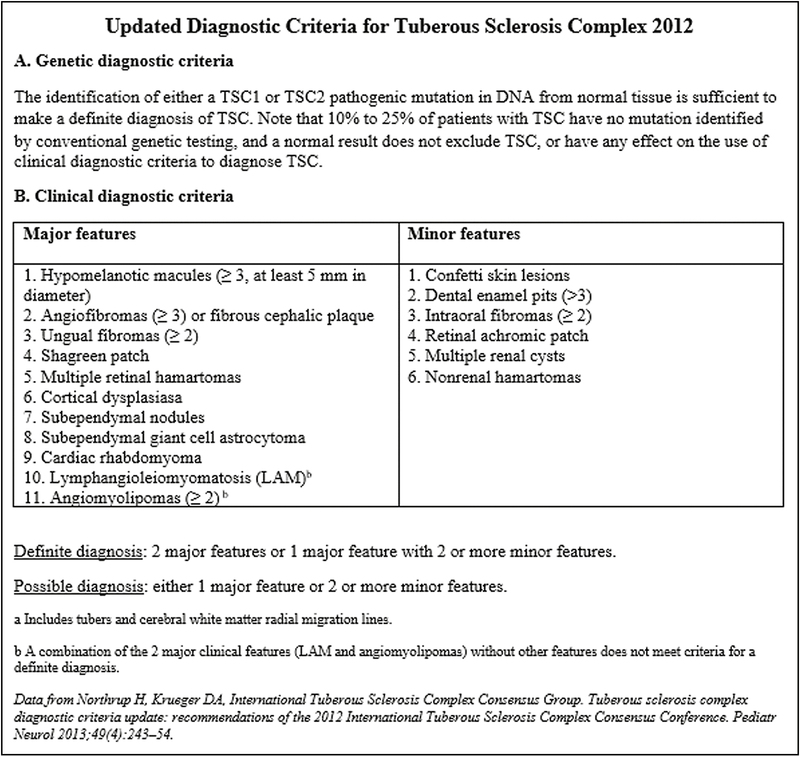 Tuberous sclerosis complex diagnostic criteria update: Recommendations of the 2012 International Tuberous Sclerosis Complex Consensus Conference. Pediatr Neurol 2013;13:243-54. Altman NR, Purser RK, Post MJ. Tuberous sclerosis: Characteristics at CT and MR imaging. Radiology 1988;13:527-32. Kalantari BN, Salamon N. Neuroimaging of tuberous sclerosis: Spectrum of pathologic findings and frontiers in imaging. AJR Am J Roentgenol 2008;13:W304-9. Pozetti M, Belsuzarri TA, Belsuzarri NC, Seixas NB, Araujo JF. Neurofibromatosis type 1 and Chiari type 1 malformation: A case report and literature review of a rare association. Surg Neurol Int 2016;13:S469-72. Urbizu A, Toma C, Poca MA, Sahuquillo J, Cuenca-León E, Cormand B, et al. Chiari malformation type I: A case control association study of 58 developmental genes. PLoS One 2013;13:e57241. 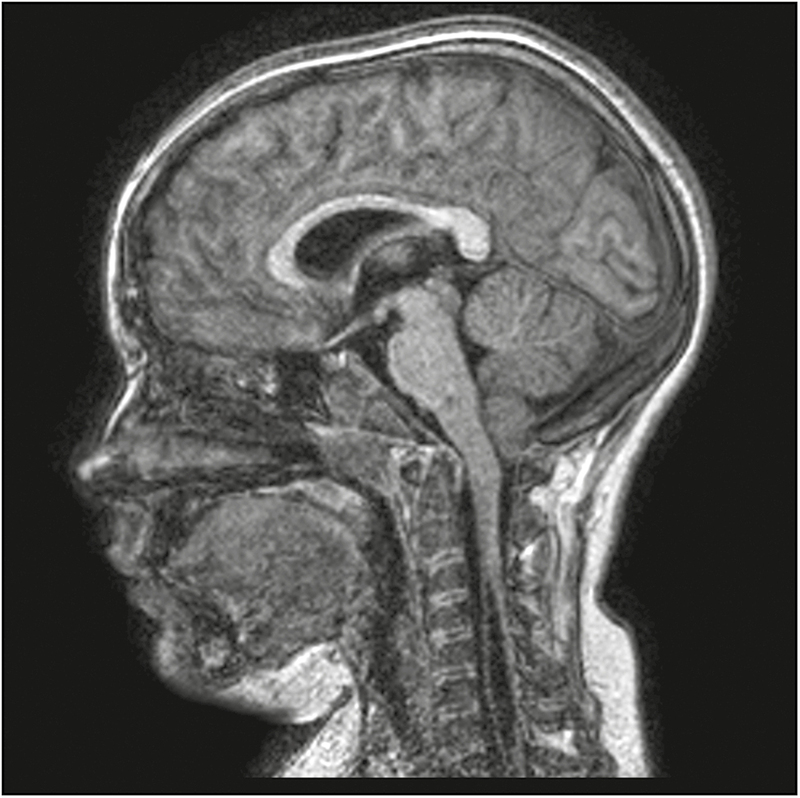 Radhakrishnan R, Verma S. Clinically relevant imaging in tuberous sclerosis. J Clin Imaging Sci 2011;13:39.